What does “sustainable” really mean? Anyway, my whole point to this is that my year in a rural farming community that was dominated by small farms (not large operations, a rarity, I know) made me think a lot about the food I eat. That is why I picked up Four Fish because fish really is the last “wild” food and because I eat a lot of fish- in fact it might be my main source of meat. Four Fish revolves around four the major wild (and sometimes farmed) fish types that people eat. Salmon, cod, sea bass, and tuna. All fish I have eaten, all fish that any big fish eater would have tried. The author, Greenberg, is an avid fisherman himself, having spent his youth fishing in Long Island Sound. By examining the these four types of fish, Greenberg gives the reader a micro-history of fishing, fish farming, sustainability and conservation. This may sound boring, but it isn’t. Greenberg’s book is an eloquent plea to help preserve the fish and the act of fishing by understanding how human actions can greatly affect a species. For example, take salmon. Did you know that back when the Puritans moved into New England in the early colonial era that the rivers in Connecticut teemed with salmon? So many that they could almost reach in and grab them? The Native peoples hunted easily with just spears. The same for Cape Cod (ahem- ever wondered about the name?) the cod that was so thick that the settlers could not believe it. The book is not all alarming- Greenberg also chronicles sustainable ways of farming fish, such as tilapia, and kahala– fish that don’t threaten the natural stocks when farmed, unlike salmon (salmon farming is incredibly problematic–let me tell you I will never look at a farmed piece of salmon the same way again.) Greenberg also chronicles why it is that mankind loves fishing for huge fish, like Tuna– because of the rush of mastering nature. His approach is remarkably evenhanded, even though he clearly has an agenda. 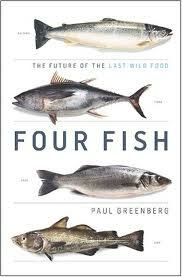 Greenberg’s book does for fish what Michael Pollen’s Omnivore’s Dilemma did for general food consumption. Greenberg wants the public to know how to carefully chose, to be informed and to take action least we destroy the very world that keeps us going. After reading this book I now know I will have to think carefully when pausing at the fish counter. Should I eat that farmed catfish or tilapia? Wild salmon is better that farmed, but really it isn’t by much. What is the true cost of eating that sea bass? I don’t think that Greenberg’s aim is to make you feel guilty, it is to make you think– think about the true costs of what you eat. When I was a little girl my dad occasionally took me fishing. He showed me how to cast a line, to bait the hook and how to use a rod and reel. I remember the first fish I caught- a little teeny trout (I think) that I reeled in with great difficulty because it fought for its life. I was nine years old. I remember we took it home and my mom gutted it and prepared to fry it. When I looked at the little fish sitting on ice I felt sad. I had killed it, and I did not want to eat it. I said this to my dad and he said “You have to eat it. To not do so is to waste, and you dishonor the fish.” Essentially, he was telling me to take responsibility for my actions, to take responsibility for the food I was putting in my mouth, and to be grateful for the fish who gave up its life so I could eat it. I ate the fish, and my dad had given me my first big lesson on how to look at food. Greenberg’s book continues that lesson. Having recently read one award-winning author by the name of Berry, I decided to pick up a book by a very different, also award-winning Barry, namely Dave. 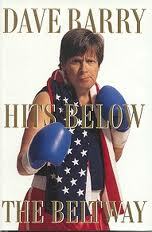 As many of you probably know, Dave Barry is one funny man. A regular columnist for the Miami Herald for a couple of decades, Barry has also written numerous books in the categories of both non-fiction and fiction (including children’s literature). Barry begins with a brief and very tongue-in-cheek account of the evolution of government from prehistoric times to the arrival of the pilgrims in the New World. The account itself is a riot, but it is made even funnier by the accompanying illustrations, many of them involving giant prehistoric zucchinis (a recurring theme throughout the book). The rest of the book focuses specifically on the U.S. government: its ever-expanding size, the highlights of a trip to Washington, D.C., the process of presidential elections, and the typical shape of a modern political campaign. The book closes with two chapters ostensibly on the 2000 presidential election, though the first chapter has more to do with the madhouse that is South Florida and the second with the indecipherable nature of legalese and the general incompetence of the media, esp. television. Surely nothing like this has gone on in recent elections </sarcasm>. Barry also has some hilarious (and yet borderline practical) suggestions for improving presidential campaigns, such as regularly injecting candidates with truth serum on the campaign trail, and requiring them to wear donor logos like NASCAR drivers. There’s no doubt that these changes would make the campaigns more transparent, as well as more interesting. One of the funniest sections of the book for me was his description of South Florida. He devotes nearly an entire chapter to this description in order to make a case for kicking South Florida out of the Union. His account is hysterical and his case strangely compelling, particularly for those who have spent any extended amount of time in the greater Miami area. If you are even half as cynical about politics as I am, you will enjoy this book. Though it was published ten years ago, it (sadly) still rings true today. My only advice is not to read it in a library – you will be laughing too loud and people might look at you funny. Other than that, enjoy, and keep an eye out for those giant prehistoric zucchinis – they sneak up on you. Nine down, (at least) forty-three to go.